Sunday January 24th 1904 The cold was simply terrible. I did the regular work and wrote and read some. Will had to bring a little calf to the house for fear it would freeze. Monday January 25th 1904 Very cold indeed. Mollie took her dinner. I was busy about the house all forenoon. We had to bring the little calf in again. I sewed some after dinner. Tuesday January 26th 1904 Still cold. It takes all the time to get thing thawed out and do the regular work. I sew a little Will went to Mr Henry Hills funeral he was pall-bearer. 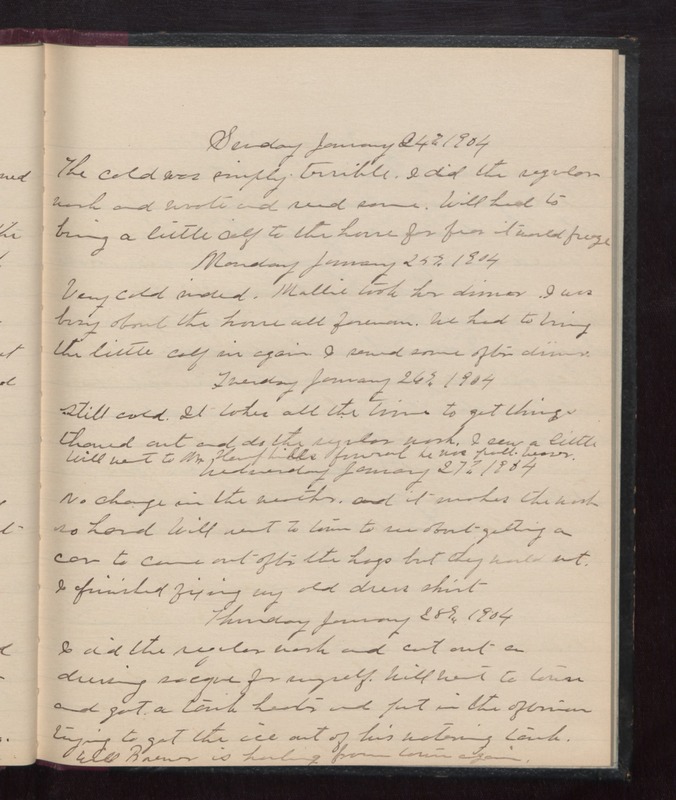 Wednesday January 27th 1904 No change in the weather and it makes the work so hard. Will went to town to see about getting a car to come out after the hogs but they would not. I finished fixing my old dress shirt. Thursday January 28th 1904 I did the regular work and cut out a dressing sacque for myself. Will went to town and get a tank heater and put in the afternoon trying to get the ice out of his watering tank. Will Brewer is hauling from town again.